Sportswriters aren’t regulars on baseball cards. This is one classy alternative for any collection! “Never miss an autograph opportunity” tugs at a hobbyist’s heart. Who hasn’t been there? A guy who MIGHT be somebody might sign. If only I had a collectible. No, not a hot dog wrapper! He’s gone. Too late! 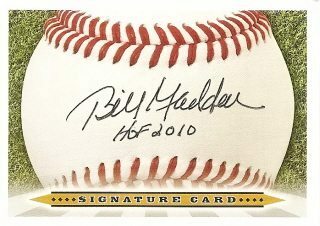 The slogan is the battle cry of “The Autograph Card,” one of the greatest hobby products I’ve ever seen. Company partners Brian Flam and Russell Miles speak the language. They are collectors, too. “Some autographs are not ball worthy,” Brian explained, noting the cost of league baseballs. Some eight seasons ago, the pair were ‘graphing the Arizona Fall League. (Brian’s passion is minor league signatures, by the way…) They had created a small amount of “signature cards” for themselves. When other collectors spotted what Brian was using, they wanted some, too. People begged to buy his extras. Others got angry that Brian wouldn’t sell any. Brian and Russell have branched off. They’ve printed custom cards for Bronson Arroyo, Mike Leake and the late Hall of Famer Gary Carter. Brian’s still using what they make. Last week, he got two Signature Cards back by mail from Bobby Shantz. Brian fills out the reverse of each card, which has lines for the signer’s name and date. When Brian sent two to the former pitcher, he included the notation “AL MVP” and “8 Time Gold Glove Winner.” Sure enough, Shantz added the same words below his autograph on the front. Check out The Autograph Card website. Along with the 3-by-5 baseball image, their other creations (including a bat barrel) are all on 16-point matte cover stock. The other designs are baseball CARD sized, 2-1/2 by 3-1/2 inches. They’re perfect for instant signing. No deglossing with baby powder or erasers needed. Is that a new first-round draft pick at the ballpark, someone with a card? No idea who that scout or roving instructor might be? Brian and Russell have our backs! Visit their Facebook page, too. They plan on running Facebook specials in the future. Write the guys. They’ll listen if you have ideas for other products — things you’d like to have autographed in your collection. Most of all, cheer them on. This is affordable quality, something all collectors need. When it’s time for a hobby hall of fame, I’ve got two nominations.